I was invited this week to The Arsht Center in Miami to check out the broadway hit Rock of Ages! They’re currently on a US tour and are in Miami until the 14th. I definitely urge you to go check this musical out. It was so much fun, a definite party. The story was engaging, you already know all the songs, the audience interaction was choice. Some of the voices were from another world basically, so powerful. I think it’s a really fun show for adults to check out. I went with my friend Erika and we basically couldn’t stop laughing at all the jokes. You absolutely will not be disappointed, unless you’re a grump haha. I picked out my outfit last minute (and shot these photos running out the door) and I think it really worked out since I was dressed up but still sort of “rock” to fit the theme of the show. I’ve had this skirt sitting on my rack for awhile, I’ve only worn it once though I really like it. I picked it up from Ideeli last year around this time actually. It was about $54, the one I linked above that looks JUST like it, is only $26. Grr. What do you guys think of my braids, now that you can see them really clearly? I’m on my way to my Halloween dream. Check out the trailer for the show and go go go! oooooh these are pretty on you! Totally different, but I love it on you. I have mine up in braids right now. I wish I had gone shorter, when i do them over I just might do them shorter. Anyway i love your skirt! It is really different. I haven’t had braids since I was a kid and at first I was like woah um maybe mistake but now I’m obsessed with them. Not having to do my hair every day is really nice too haha. I wish they were longer actually, how come you like them shorter? 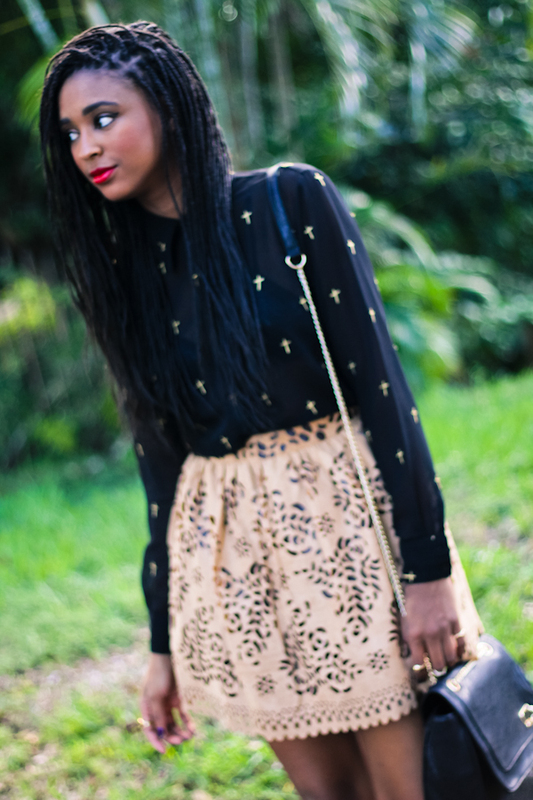 Totally digging the braids and the blouse… I have an obsession with crucifixes. I don’t think I’ll ever have dreads but that’d definitely have been a surprise. Love your top & the shoesies too! I hate when I find stuff cheaper then I bought it for. Yeah I went from…I don’t like them, to ok they’re fine, to lemme just flip my hair back and forth because I’m just OBSESSED with them. This top is so choice, it’s always a good pick for every outfit. It’s interesting to see it coming back around in smaller online boutiques. So excited to see your Halloween costume, that was one of my favorite movies growing up! Love the skirt, the cutouts are so cool! loving the braids! i love this skirt, i might need to check out the $26 option! 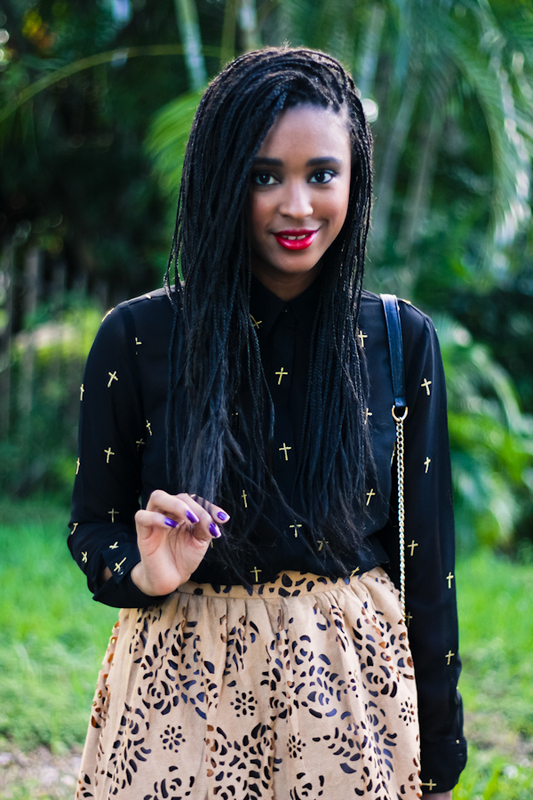 I like the new braids and the Asos cross top. I can’t believe how long it’s been since I shopped at Asos–need to stop over there asap. 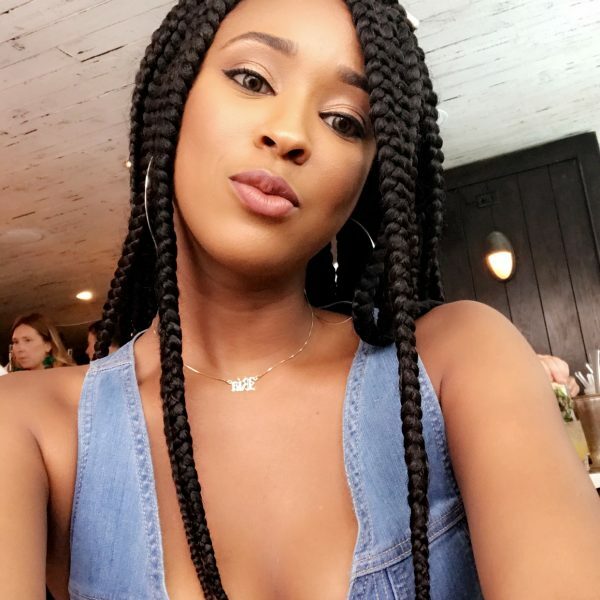 Looking SO gorg, lady<3 We are loving the braids! Gaaaaaaaaaaaaaaaaaaaaaasp! Love the braids! Cannot wait to see how this Halloween outfit comes out. I’ve been wanting to check out Rock of Ages. Hubs and I were just discussing how we needed more of them. The US is just so cynical. I’m not gonna lie, when I first saw your braids I went, “gasp!”. It shocked me BUT in a good way. I think they look great! I read your comments and I felt the same way about my bangs. At first I was all, “ahh, I’m an idiot! !” and now I’m all, “everyone should get bangs cause they are the best thing ever! 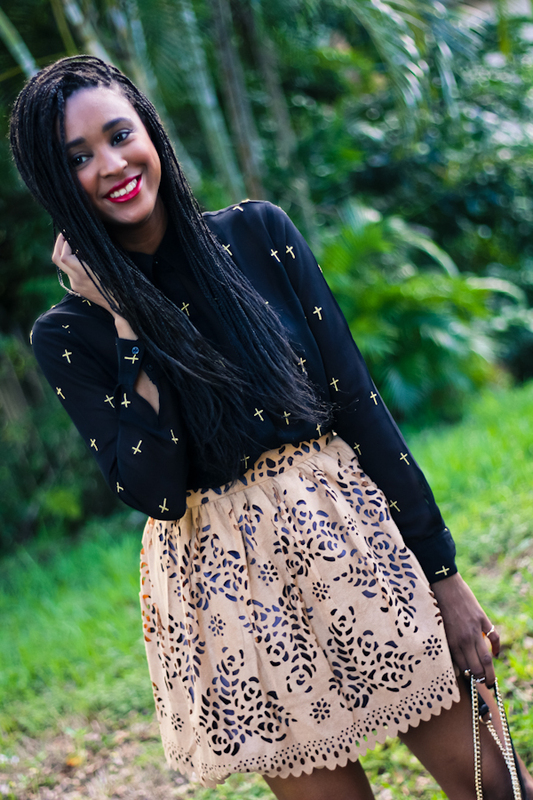 !” Anyways, I love the cutout skirt! I can see how it can go rocker and sweet from one outfit to another. Love! I like you with the braids, and I can so see your halloween costume shaping up. I’m excited to see the final look! I’m glad you two had fun at the show. You finally wore the skirt!! what do you think to follow each other? ? I’m pretty obsessed with your skirt. SO femme and edgy at the same time. You look cute on that outfit!And your hair is awesome! love your style! that skirt is amaze! i would’ve def worn this to a musical too! This look is so fly!!! I love the color choices and Lord knows I love prints so you got me with the top and the skirt compliments it just right! The details like nail color and lip color added that extra somethin’ it needed!